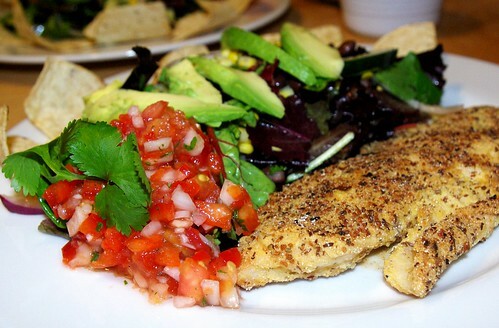 cornmeal and flax crusted tilapia with fresh cilantro salsa and cilantro lime dressed salad, originally uploaded by aarn! +6th April, 2009+. took 1/4 of a large seeded habenero and ground it with some onions and garlic, then added that to some diced sweet red pepper, diced tomatoes, salt, pepper, lime juice and fresh chopped cilantro, mixed and let chill. using a mortar and pestle, ground together one dried arbol chili pepper, a pinch of dried mace, a pinch of dried garlic, pepper and salt. added this spice mixture to a mixing bowl with some all-purpose flour, ground flax seed, fine ground corn meal, and coarse corn meal, did a dry-wet-dry of this mixture and a beaten egg onto two 1/4-lb fillets of tilapia, then slipped them into a hot pan with 2T. of canola oil. let the first side brown, and to ensure crispiness without deep frying, flipped the fillets over and transferred the frying pan to a 375-degree oven for 5-minutes or so, until the bottom side of the fish was brown and the feel was right. plated the fish with some of the delicious and fresh salsa, some sour cream spiced with chili powder and cumin, and a mixed spring green salad with fresh sweet corn, red onion, cucumbers, and avocado slices, tossed in some lime juice and olive oil, muddled with some cilantro and salt and pepper.